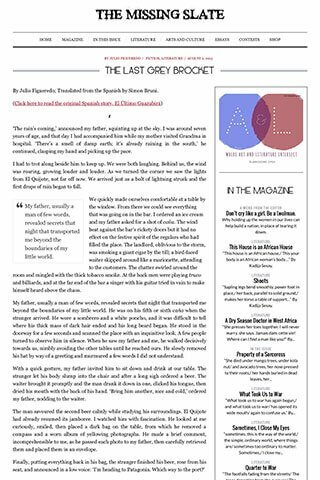 Published on The Missing Slate, this short story is part of Julio Figueredo’s book “At The Even Hour: Confessions and Regressions”. Julio Figueredo was born in Montevideo, Uruguay, in 1944. He was a window dresser at the Angenscheidt department store, a basketball player for Club Goes, a lover of the arts and a supporter of the Lista 99. In 1967, he emigrated to Europe and became a citizen of the world. He has lived in many countries, working in all manner of trades. He was a model and acted in film and television. In London he married Karen Doherty, with whom he founded the now legendary restaurant, The Camden Brasserie. He currently lives in Punta Ballena, Uruguay, and Camden Town. He has always written. “At the Even Hour” is his first book.